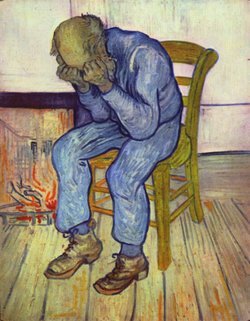 CHRONIC DEPRESSION ----- THE WAY OUT ! Dear Anita, I am a divorced male, 47 yrs old. I have a terrible problem. Can you help me ? I am depressed all the time. LIke my heart had a spear through it, full time. The thoughts are so negative, one after the other. What should I do? THIS BLACK CLOUD DOES NOT GO AWAY. I keep getting fired from jobs...I see the cup as half empty all the time. I drive away lovers or pick the wrong ones. Like my last sweetie was a married woman! She wants me back, but I got the heck away from her and out of it. Still, this feeling that my choices were wrong, that I've ruined my life, that it cannot be fixed. HELP!" D.B. in Portland. OK! READ THE INSTANT CURE TO DEPRESSION FILE. Dear X: After you get on a total healthfood diet and get more sleep, the big component of depression, and after you go to yoga class, next, learn to use your mind to CREATE A BLISSFUL FUTURE!. Read THE SECRET file. Oprah thought enough of this secret to put it on twice. 1). Light a candle, some incense and PRAY, "GOD take away my blues, please. I realize that you are marking the really happy PATH to joy and bliss with two walls on either side of me, which I in my limited state, VIEW as limits. I will start to see your will every time I bonk in to the cement. 2.) Lavish yourself with meals full of SOLAR foods, bright red, bright green, bright orange. Like eat four oranges. Between meals, I mean. Or make that your lunch. Have a huge tossed salad, dark green, with your lunch time protein of choice. When depressed, eat an orange saying 'God I salute your choice of foods for us. I am banishing darkness by eating this globe of sunlight which contains the same MAGIC LIGHT which you put in every star, every sun. I am eating sunlight. This fruit gives happiness. THANK YOU!" 3.) Walk in nature, concentrating on what is outside your body visually, not once focusing on contents of the garbage can between your ears with its limited thinking. When these thoughts of duality arise, keep saying 'how it is..is perfect. God is wise." Nothing more.